Protect your baby with the #1 pediatrician recommended brand! 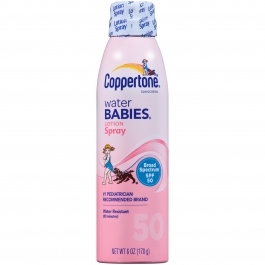 Coppertone Sunscreen Water Babies Lotion Spray provides your child with broad spectrum UVA/UVB protection. Its milk formula won't irritate or sting baby's delicate skin. Coppertone Sunscreen Water Babies Lotion Spray: Hypoallergenic PABA-free, Dermatologist tested Contains no CFCs which deplete the ozone layer. Shake well before use. Apply liberally And rub into skin adults And children 6 months of age And older apply evenly And liberally to all exposed areas before sun exposure. Ensure complete coverage. Do not spray directly on face. Spray into hands And apply to face. Use in well- ventilated areas. Reapply as needed or after towel drying, swimming, perspiring, or vigorous activity. Children under 2 years of age: should use sunscreen products with a minimum SPF of 15. children under 6 months of age: ask a doctor. Inactive Ingredients: Water, dimethyl ether, sorbitol, styrene/acrylates copolymer, vp/eicosene copolymer, stearic acid, triethanolamine, sorbitan isostearate, benzyl alcohol, dimethicone, tocopherol (vitamin e), polyglyceryl- 3 distearate, fragrance, methylparaben, acrylates/c10-30 alkyl acrylate crosspolymer, propylparaben, disodium edta. Active Ingredients - Purpose. (To Deliver) Avobenzone 3%, Homosalate 13%, Octisalate 5%, Octocrylene 2%, Oxybenzone 4% - Sunscreen.Inactive Ingredients: Water, Dimethyl Ether, Sorbitol, Styrene/Acrylates Copolymer, VP/Eicosene Copolymer, Stearic Acid, Triethanolamine, Sorbitan Isostearate, Benzyl Alcohol, Dimethicone, Tocopherol (Vitamin E), Polyglyceryl-3 Distearate, Fragrance, Methylparaben, Acrylates/C10-30 Alkyl Acrylate Crosspolymer, Propylparaben, Disodium EDTA. Do not spray directly on face. Spray into hands And apply to face. Use in well- ventilated areas.